Home	Banknotes	Decimal Paper	Decimal Twenty Dollars	Twenty Dollar. Fraser/Cole. Run of 10. Twenty Dollar. Fraser/Cole. Run of 10. Twenty Dollar.Fraser/Cole. Circa 1991.First Prefix.Grade:Uncirculated. Run of 10 banknotes in sequential order. The Twenty Dollar Fraser/Colepaper banknote, was the second to last paper banknotes issued in 1991. 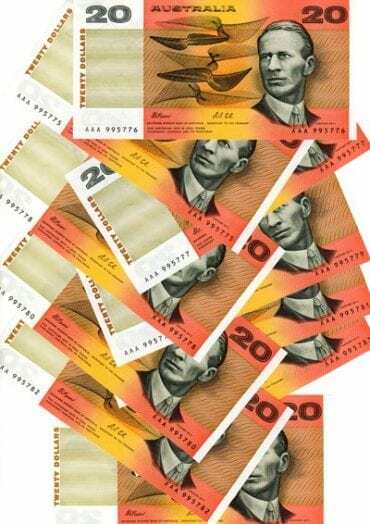 The first prefix AAA was issued by Note Printing Australia a subsidiary of The Reserve Bank of Australia. Basic colour of red and yellow with approximate dimensions of 160X81mm. Sir Charles KingsfordSmith(1997-1935) on the obverse side. Mr Lawrence Hargrave(1850-1915) on the reverse side. Highly collectable banknote in the paper banknote series as a first prefix of AAA; very rarely seen in this superior grade of uncirculated. Runs of 10 are described as extremely rare. Stocks are limited. 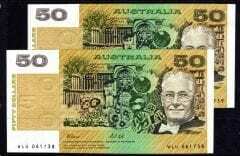 Be quick to purchase by way or direct credit to Australasian Banknote.com.au, cheque,money order or Pay Pal.